Twitter (s twtr) often uses its mobile apps on iPhone (s aapl) and Android (s goog) as launch vehicle for new features, which now includes a new way to share photos. On Wednesday, the company announced in a blog post that Twitter users on iPhone will be able to tag up to 10 people in photos, and include up to four photos in a single tweet. According to the blog post, the feature will roll out to the Android and desktop versions of the platform in the near future. Not only does the original post not say that this feature is iPhone-exclusive, the pictures of it in action use an Android phone. C’mon GigaOM! 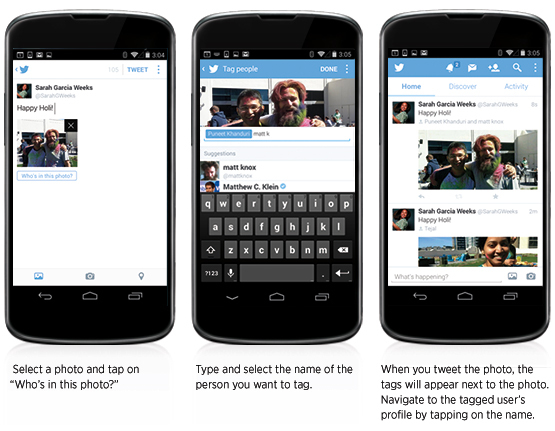 Oh, and Twitpic has allowed tagging for years now. Twitter is just too far behind.